Great Shift TG Captions: The Reception (Part 2) - TG Captions from The New Great Shift Captions! Charlie immediately went looking for his new bridge, even though he figured she might’ve been swapped too. INTERESTING STORY, good series of pics. I wonder if Angela is really Angella? 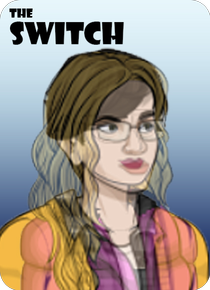 interesting seeing in part one it said ALL IN THE WORLD HAD SWAPPED, so if Angela was not Angela then who is in her body?